Have you thought about live-streaming your lectures? Have you heard about Periscope? it is a great tool, you should check it out. Today I took a giant personal leap in my lecturing career and streamed one of my lectures at Laurea UAS using the Periscope -app. We had 70 viewers from all around the globe. Thanks to all the supporters. Fantastic! Thanks for reading. Wishing you the best experiences in live-streaming! 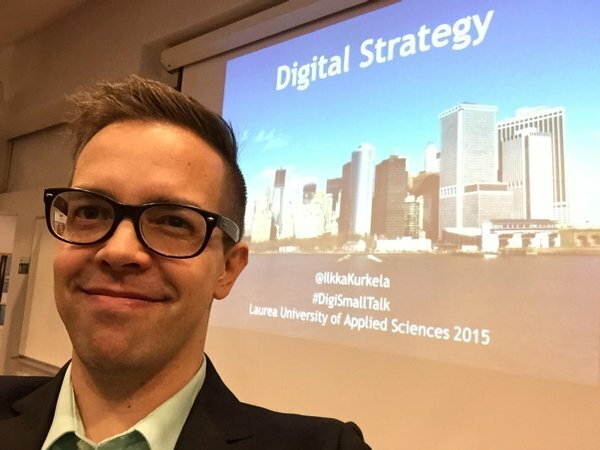 The lecture was part of our Digital Business -study module at Laurea University of Applied Sciences. Please check our Facebook page for more information. This entry was posted in Yleinen on 22/10/2015 by Ilkka Kurkela.